For the last couple of weeks, my delightful children have been sharing a room. Let's just say that they've been less than delightful when they wake each other up before 6 now most mornings. Prior to them sharing, they both slept till about 7:15am - and when they did wake they just stayed in bed and chatted away to themselves for a wee while. But it's been a bit of a shock to the system, and I've thought about going to bed earlier - but haven't managed an early night yet. This morning though, when I heard the rain falling outside, I wondered if it meant that they'd sleep for longer. And to our great relief when they woke and I felt around for my cellphone - I was thrilled to see it was after 7. And even more thrilled that today their father got up and took them into the lounge to watch Sunday morning tv programmes so I could sleep in, or lie in bed and read my book - bliss! Who would've thought almost 4 years ago BC (before children) I would've cherished sleeping in till after 7 on a Sunday morning? 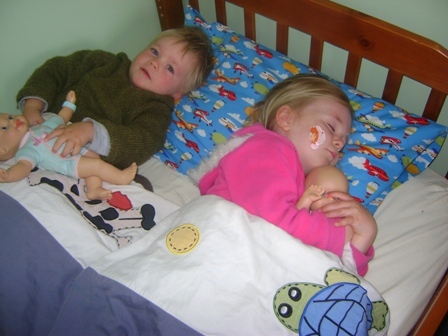 The kids playing Mummy and Daddy this morning in Timothy's bed. 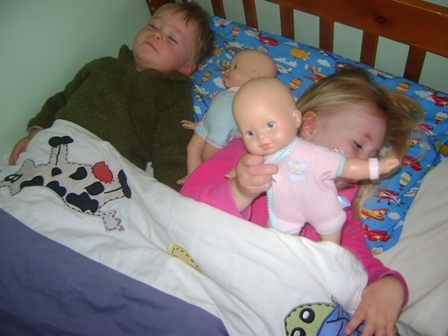 Don't you love how angelic they look when pretending to be asleep? They look very cute !! I can relate, we're getting some early wake ups here too.